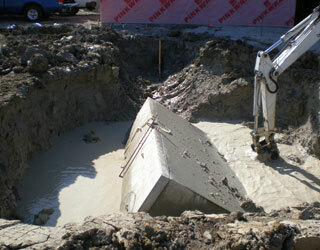 As an OWTS Registered Installer, Septic Tank Installation is Dirt Works Excavating & Construction's specialty. We know the proper methods for designing, installing and repairing your septic system in the Kansas City area. A properly design septic system is key to making sure that you do not end up with an overloaded wastewater system. We take into account the number of people living in your home, soil types here in the Kansas City area, and other factors when designing the proper septic tank system for your home. 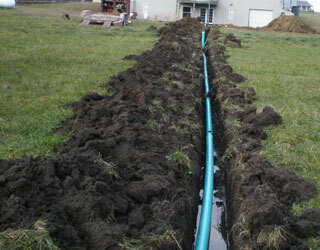 Once we have designed the proper septic system for your home, installation begins. We will dig a large hole, and place the proper sized septic tank in to hold the solid wastes from your sewer system. 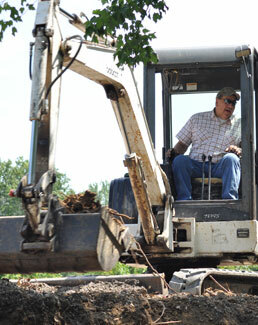 A very important part of a septic system is the drain field. A pipe will be placed underground that will carry the liquid wastes to be distributed through a series of small, shallow trenches lined with gravel or plastic trenches covered with soil. The soil in this drain field area is loaded with bacteria which will purify the liquid waste before it makes its way to the groundwater. These area should be primarily be covered with grass as tree roots or vehicle traffic can cause damage to your drain field. If you live in the Kansas City area and need septic system repair, chances are you need it FAST before any damage occurs. We will do everything in our power to service you as quickly and professionally as possible. Don't be afraid to call us on the weekend, we understand that everything always goes wrong when it's least convenient. 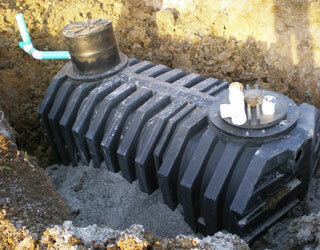 Call Dirt Works today for your Kansas City Septic Tank Installation and Repair needs.